I’ve been a bit surprised to find my home state of Minnesota in the headlines today – and a lot of it is not good news. So if you’ll indulge me for a moment, here are some of the big stories emanating from up here in the tundra. * As Martin Longman mentioned earlier today, several white supremacists shot 5 people at an ongoing Black Lives Matter protest in Minneapolis last night. According to a police report today, two suspects have been arrested. * The Black Lives Matter protest is in response to the Minneapolis Police killing of 24 year-old Jamar Clark. Gov. Mark Dayton met with Clark’s family last week and renewed his call for a special legislative session to discuss racial inequality in the state. 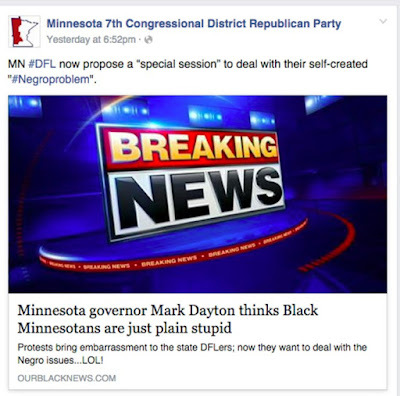 Here is the response from the GOP’s 7th Congressional District (note: DFL stands for Democratic Farmer Labor Party). But yeah, we’re all so totally post-racial these days…not! * In the midst of all that, Jennifer Bradley has written an in-depth report for the Brookings Institute titled The Changing Face of the Heartland: Preparing America’s Diverse Workforce for Tomorrow. It focuses on the increasingly diverse population in Minnesota as an example of the changing demographics in the country. Bradley outlines the racial disparities in both education and employment as well as the work of several collaboratives to eliminate them. Now, let’s move on to the other news of the day. * If you want a good explainer about the news today that Turkey shot down a Russian warplane, I suggest reading what Max Fisher has to say about it. * On his way out the door as Governor of Kentucky, Steve Beshear signed an executive order restoring the right to vote and hold public office to thousands of non-violent felons who’ve served out their sentences. * Former Republican speechwriter Barton Swaim has written “The Perfect Republican Stump Speech,” with graphics provided by the folks at FiveThirtyEight. * And finally, today the Kasich campaign released an ad going directly after Donald Trump. It’s a bit foreboding – but rightfully so.